A new gallery has been posted to the website. You can view it here. 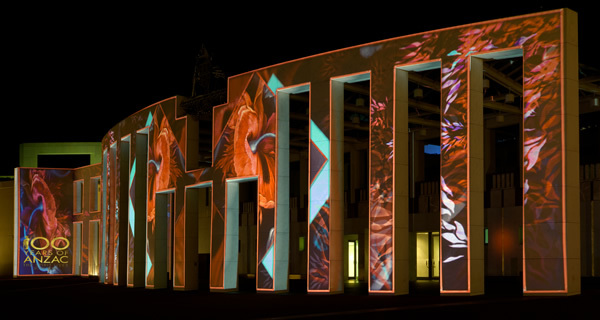 Enlighten Festival 2018, Australian Parliament House, Canberra, ACT. 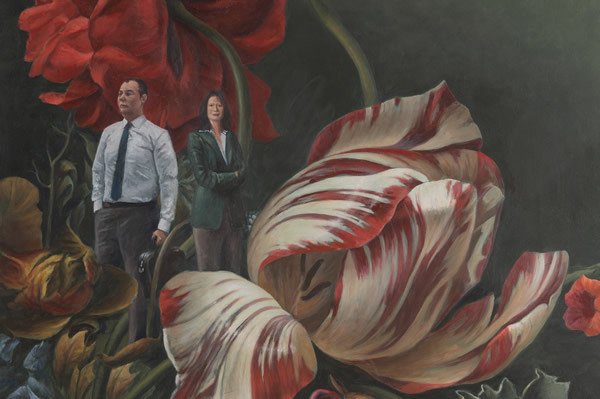 Featuring artwork - James Guppy, Red Poppy, 2005, Parliament House Art Collection. Image credit DPS. The 11th of November 2018 marks the 100th anniversary of Armistice Day and the end of hostilities on the Western Front in World War I. After the war the red poppy became a recognisable symbol of remembrance following the publication of the poem In 'Flanders Fields'. James Guppy's evocative painting of a single red poppy against a dark background is a silent tribute to the 62,000 Australians who fought and died in the Great War. James Guppy will present a solo exhibition titled In Flagrante Delicto at Tweed Regional Art Gallery. The body work reflects Guppy’s outlook on the business of the world and those involved in the key decisions made on behalf of the people. Pondering our choice to look to these leaders as models of ethical behaviour, Guppy questions the actions of these people and the systems by which they gain their power. Having gained an Honours degree in Economics forty years ago, Guppy’s critical lens on such issues sees him aim to highlight the often reprehensible behaviour of those in positions of power. The latin title In Flagrante Delicto is a term used to indicate somebody being caught committing a criminal act. Pairing this critique of contemporary capitalism with pre-modernist notions of beauty the artist has created a visual language for the viewer unravel and consider their own thoughts on such issues. For more information on this exhibition please click here. All are welcome to join James Guppy for an exhibition talk in the Anthony Gallery as he discusses In Flagrante Delicto. This will be followed by an illustrated talk in the Frances Mills Education Centre when the artist will share images of his earlier works and inspiration. 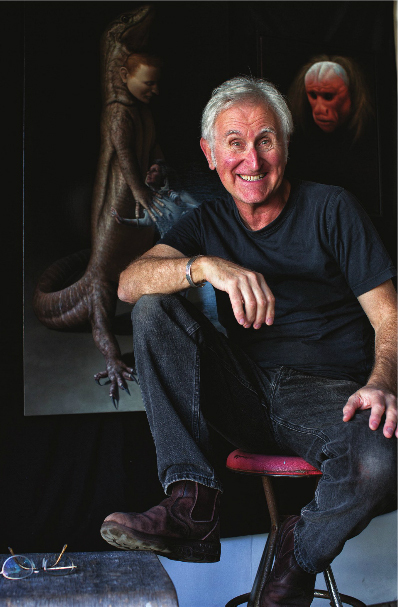 James Guppy features on the cover of the current issue of the Byron Arts Magazine in an interview with editor Alana Wilson. Image courtesy of Byron Arts Magazine. Photograph by Natalie Grono. 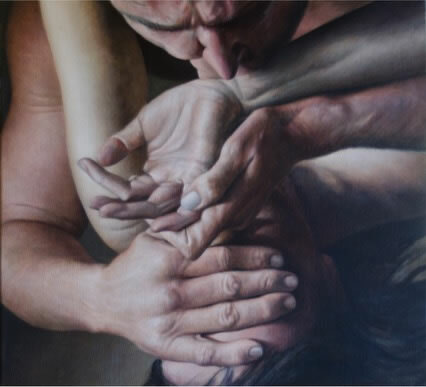 James Guppy is a finalist in the Paddington Art Prize 2016 for his work The Romantic. The $25,000 national acquisitive prize for a painting inspired by the Australian landscape is awarded annually with the announcement of the 2016 prize made on 20 October. The judges for the 2016 prize are Wayne Tunnicliffe, Head Curator of Australian Art at the Art Gallery of New South Wales; and artists Craig Waddell and Wendy Sharpe. For more information on the prize please click here. James Guppy is a finalist in the 2016 Bayside Acquisitive Art Prize for his work Negotiated Settlement 2016. Held at The Gallery at Bayside Arts and Cultural Centre, the $15,000 painting prize will be announced at the official opening on Thursday 12 May 2016. The 2016 judging panel consists of Guy Abrahams, CEO & Co-founder, CLIMARTE; Kirsty Grant, Director & CEO, Heide Museum of Modern Art and Julie Skate, Gallery Supervisor, The Gallery @ Bayside Arts & Cultural Centre. For further information on the prize please click here. How Sweet is the Sheperd's Sweet Lot! I discovered that in the south of France, shepherds would use stilts every day. They went everywhere on them, even sitting on their stilts knitting as they watched their flocks. As I began work on this series, I did my usual thing which is to look at a lot of Goya’s work. 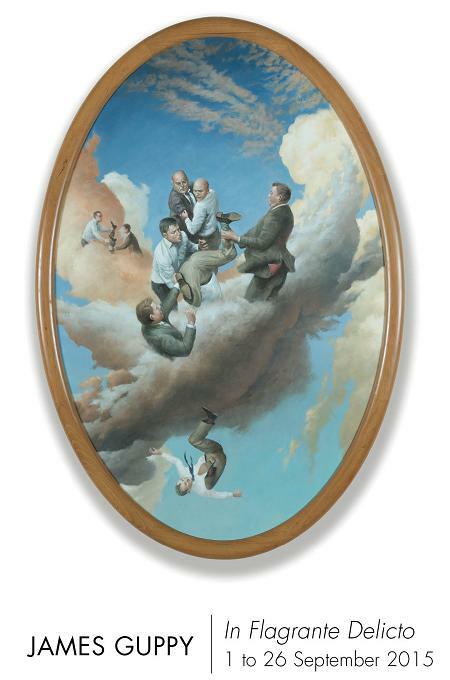 I found an intriguing painting he did of men on stilts and it really buried itself in my brain. I started googling images of men on stilts and somehow the idea was born. It has fleshed itself out with my increasing preoccupations over our crumbling, inequitable society, the rampages of climate change and the seeming disinclination of our people in power to change the course of destruction we are on. In our current society, while lip service may be paid to an idea of "stewardship"; men in power seem to have other priorities. Rather they exist separated by the entitlements wrought from power. They are far above the rest of us as they walk among the clouds, but those long stilts do look very slender and fragile as the society beneath crumbles. 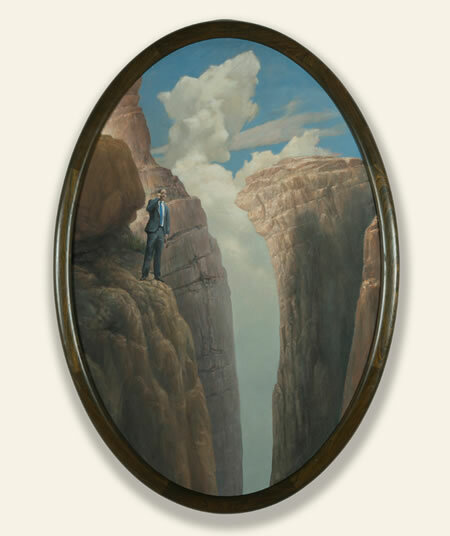 The central motif of this series has evolved as the suited man in the landscape. The suit is the uniform of Power. The suited man goes about his business immune to what occurs around him. Meanwhile... something is descending upon us that is almost beyond control. 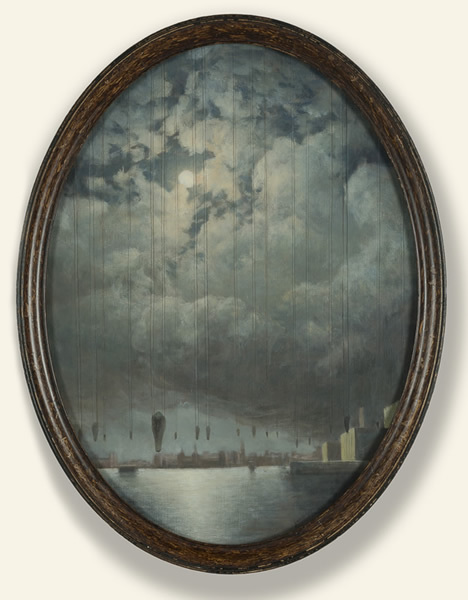 The old ornate frames became a perfect surround for these apocalyptic works as a fitting complement to the historicism inherent in the paintings. I do like playing with time... suggesting the future in the language of the past. I suppose yet again these are not "happy" little bits of decorative painting. I paint what consumes my thoughts. "The works I have been creating over the last few years are my attempt to revisualise our earliest past... a time when the line between human and animal was permeable and the earth that we came from still clung to our bodies." So opens Guppys artists statement for this survey exhibition at art piece gallery. It is the first time in twenty five years that this local artist has exhibited in the shire and it is an honour to host this show. Guppy is much more comfortable in the world of fairytales and myths – his work refers to the fantastic stories of his English childhood. This is his way of understanding the land he was growing up in, offering another way into the mysteries of his psyche. If animals were the starting point for this collection of paintings, Guppy was not interested in domesticated creatures but in the way their untamed forebears move within our psyche. "Animals weave within all our old stories, explaining our complex humanity to us. I’m trying to locate the oldest stories from those primitive interior places where human and animal coexist." 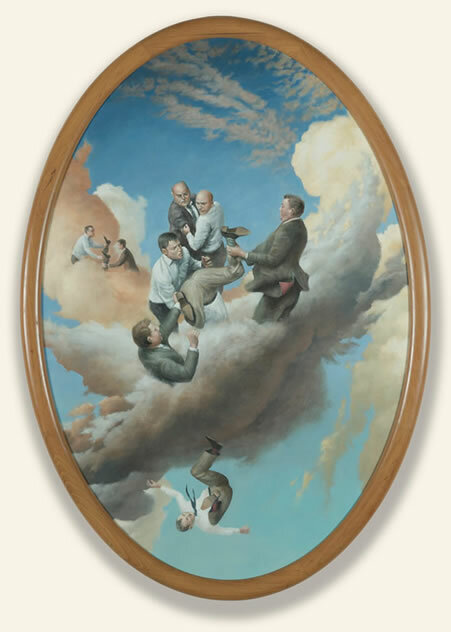 Guppy has also included the intimate, sometimes provocative, photographs behind some of these mythical, narrative paintings. The photographic scenes are carefully constructed in collaboration with his wife Trude who fabricates the garments and headdresses. Local luminary, passionate art lover and one of the models for these paintings, Lynda Dean opens the show. Expect revelations.